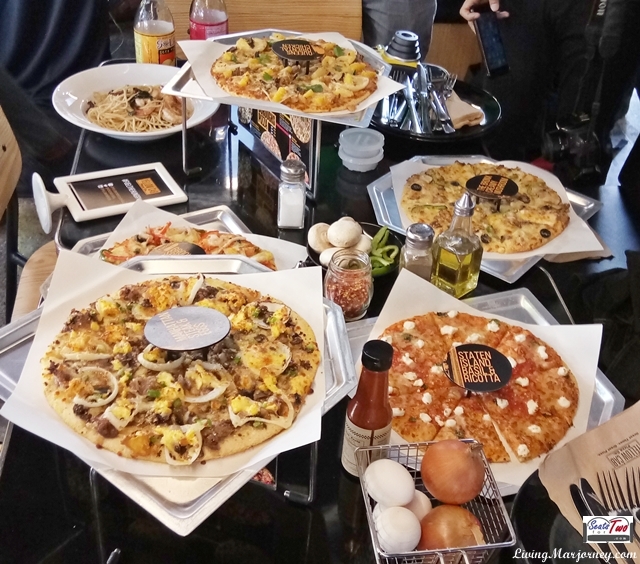 Home > Foodie > Yellow Cab Introduces 5 New York Boroughs Pizza! 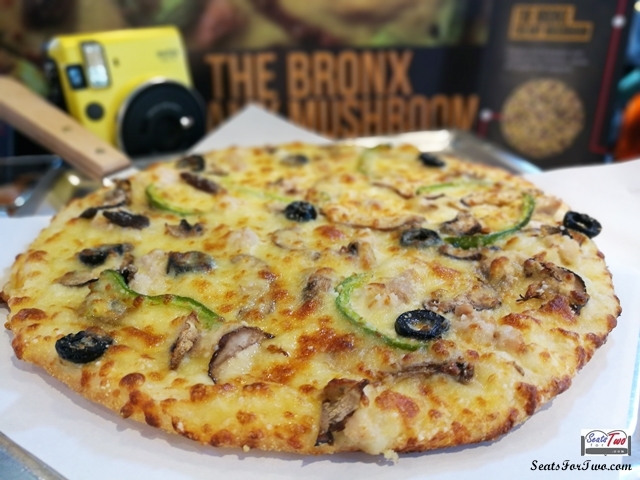 Yellow Cab Introduces 5 New York Boroughs Pizza! 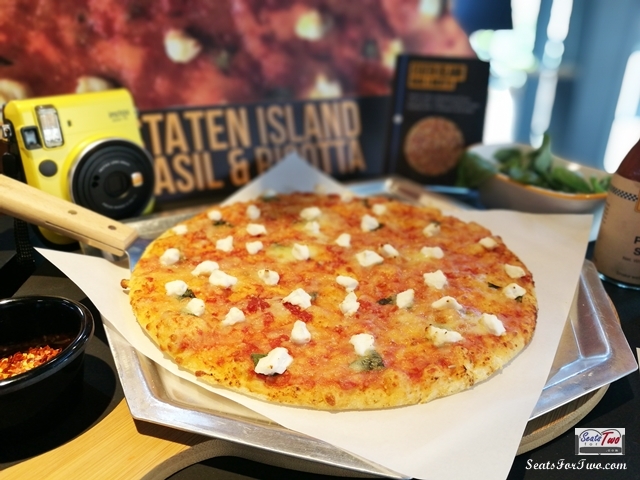 Yellow Cab recently introduced 5 new pizza variants inspired by New York’s famed boroughs including the Bronx, Brooklyn, Queens, Manhattan, and Staten Island. 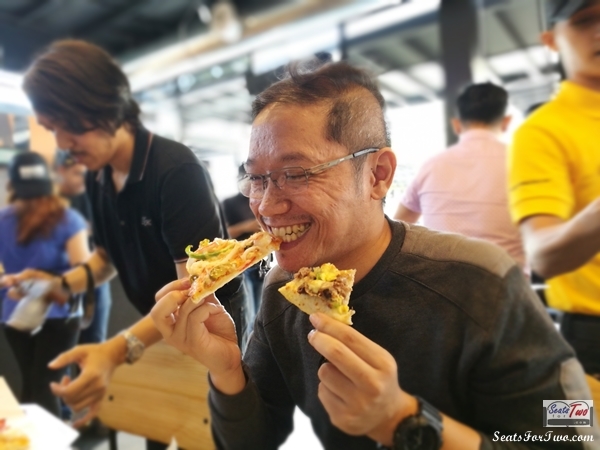 For the longest time, we’ve known Yellow Cab for its New York’ Finest pizza variant. So Seats For Two immediately obliged upon Yellow Cab Pizza Co.‘s invitation for the media launch of their new 5 Boroughs Pizza! The launch was held at their newly opened store in Paseo De Magallanes in Pasay City. We could say that they had the millennials in mind when they designed the store as it has a lot of “instagrammable” angles from the outside of the store to the interiors. All this while maintaining the standard Yellow Cab Pizza vibe. We had the whole store to ourselves together with other online media outfits and bloggers. They also had a setup of the 5 boroughs pizza variants on display with yellow Instax cameras right beside each, for instant snap souvenirs. The Bronx Creamy Mushroom Pizza immediately caught our eye. It had generous toppings of chicken, olives, green bell peppers and a mix of mushroom in a white sauce. It was one of our favorites and we’re sure mushroom lovers would drool over this as well. 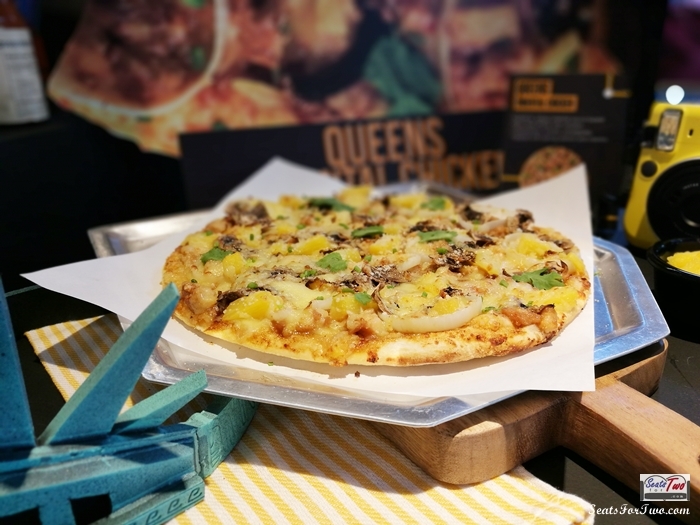 Up next, the Queens Oriental Chicken Pizza hinges on popular Asian flavors inclined towards sweet and tangy tastes. It has chicken, mushrooms, onions and pineapple. Cilantro and spring onions added more flavor and aroma. The 3rd boroughs pizza is the Staten Island Basil and Ricotta Pizza. Beyond just the ricotta, this variant actually has 3 kinds of cheeses, complemented by the tomatoes and basil. This one is for the cheese lover! Moreover, and even if we don’t have a photo of it, the Manhattan Steak and Eggs Pizza deserves a special mention as we consider it the most filling among the five! It is prepared with steak strips and topped with onions and bell peppers, among others. 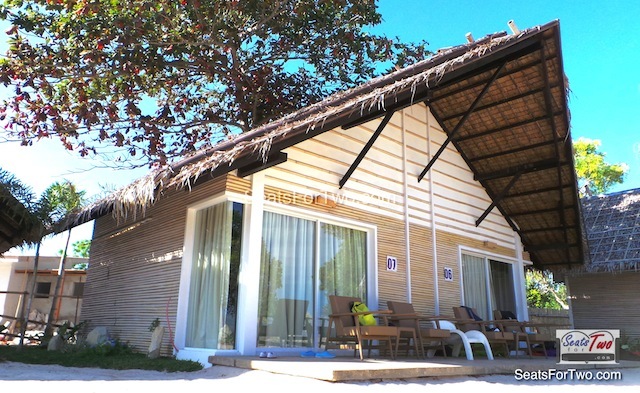 This one is for those with bigger appetites! 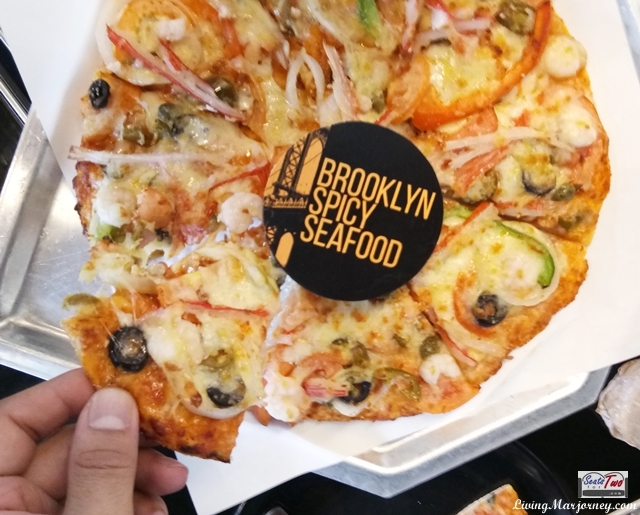 If you’re in for some spicy pizza then the Brooklyn Spicy Seafood Pizza would nail it. Made with Jalapeno peppers, crab-sticks, shrimps, capers, peppers, and tomatoes, this final fare would send your senses up a notch! Our No.1 Yellow Cab Borough Pizza Is . . .
Mr. Seats For Two enjoying his pizza! Yes, the Bronx Creamy Mushroom Pizza is our top pick and gets the “Seats For Two Thumbs Up“! Lastly, the 5 boroughs pizza is best paired with a can / bottle of iced soda; you might want to add a serving of a Yellow Cab pasta as well! An even better news is that Yellow Cab‘s 5 Boroughs Pizza will be available until next year – January 31, 2019. You can get them for only Php 499 on regular size, Php 759 for large, and Php 999 for the New-Yorker size!